cular. Near Matlock-Bridge are two chalybeat springs. Sir Richard Arkwright erected cotton mills here also." flux than it can supply with suitable accommodation; though in consequence of two other warm springs having been discovered at different periods, the buildings have been multiplied to such an extent, that they are now computed to be capable of receiving many hundred persons in addition to the regular inhabitants. Before the discovery of the springs, no trace of a wheel had been seen in the dale, which was covered with wood; but after that event, a road was formed along the western bank of the river. The valley itself is above two miles in length, and it runs, not without several considerable deviations, in a northern and southerly direction. 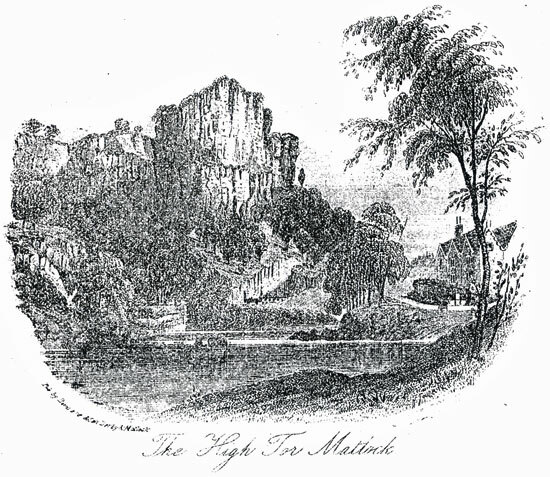 Matlock-Bath, whether seen from the hills or the valley, presents a singularly picturesque and beautiful appearance. And all can taste them." Here then is a scene to illustrate the philosophy of the author of "The Task ;" to pour upon the heart the inspirations of poetry ; and to realize the feelings with which the " Minstrel Girl " of Whittier's imagination, gazed on such a soul-soothing prospect. Were prompters to her dreams of heaven. Like music, from the hills of green ! The minstrelsy of leaf and bird. Of monarchs, to their slumbers gone."